There are two ways to add a new farm code in the Farm Codes screen, accessed through the Settings menu. If you want to add a Section, Totalling code, Category or Extended code, click on the + symbol in the top right corner. Next, select the type of code you want to add. If you want to add a Category or Extended code, scroll down to the Section or Category that you want to add a code to i.e. adding Soil Testing to Fertiliser. Now you need to record some details about the code you have added. 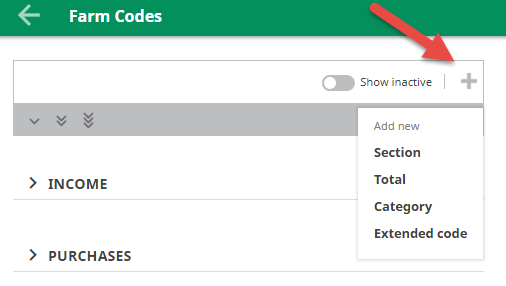 If you’re adding an Extended code, select the Parent Category Code that you want it to sit under i.e. Fertiliser.If you’re adding a Category, select the Section that you want it to sit under i.e. Farm Expenditure. Enter a code abbreviation i.e. ST and a Name i.e. Soil Testing. 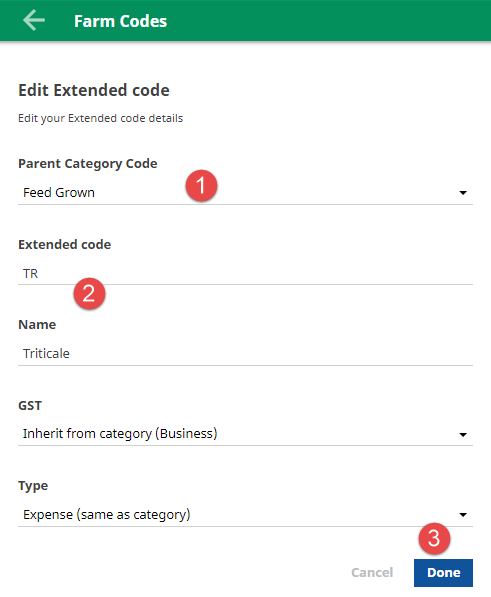 If you’re creating an Extended code, the GST type is inherited from the Category i.e. Fertiliser is 15% claimable while Wages are exempt of GST. If you’re creating a Category code, the GST type reflects the Section it sits under. items such as rebates and other farm income. Farm working, capital and personal expenses. Livestock sales and purchases including grazing. 3. Click Done, to save the new code.